Good move Tracy, im going to try to drag Tony C. with me to fish the 20th and 21st. Hope to see everyone there! Good strategy, Larry! Fill up the pegs with Tony and Carpbowl and any other anglers who aren't in the league anymore. You decrease the statistical chances for any of us still in the league to get a decent peg, and you increase your chances to maintain that big lead in both total weight and big 5. Thanks, a lot! That vest is yours! See you in 10 days. You have a point Frank, Im going to see if any of the neighborhood fishermen want to come carp fishing on the 20th and 21st. Wife and grand daughter too! Im out for the 20and 21st im going to the air show! I'm going to the air show, too, but I'll be watching it from Ashland.Sun-Times. Since you didn't participate at Montrose, you can get in for daily weight/daily big fish money. Skeered! You'll be there, especially if you get bellied up by teenagers at Montgomery. Went through Montgomery yesterday, it was elbow to elbow at the Dam. Good LUCK Sunday, stay dry. As we move into the August and September sessions of the Windy City Carp League, I want to keep the WCCL 2011 website as accurate as possible in regard to who is eligible for end-of-series awards. 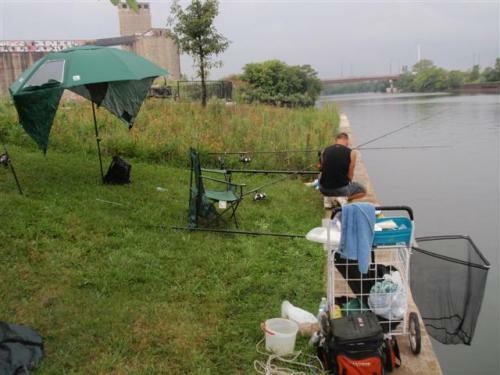 Unfortunately, not all of the 16-18 anglers who have fished the 2011 Windy City Carp League have kept up with their fees ($20 per weekend/$100 for the five weekend series). To my knowledge, only the anglers whose names that follow have paid their fees to date and are eligible for end-of-series awards. Let me know should corrections be required. Those currently up-to-date with fees (to my knowledge): Andy Burnagiel, Tracy Jourdan, Dan Ramir, Frank Rink, Larry Seeman, Marcin Szydlowski, Paul Wells. Good idea Frank, at least we would know were we stand. If i enter a tourneyment that cost me 100.00 and if i win, and end up with 125.00, is it really worth it? Just rather enter daily total weight and big fish pots. Another thing the WCCL Championship weekend is the same day as the Nascar race in Joliet, so dont think i can make them both. The WCCL Championship weekend also falls on the same day as the Hoosier Carpers Tournament Trail event at Elkhart, IN on September 17, so I think I'll be in Indiana on Saturday and Illinois on Sunday. Happy Birthday to Paul Wells! Well, it's on to the Chicago River on Ashland Avenue this weekend for the WCCL. We got relocated due to the Air and Water Show, but I actually like the new venue better. I think there is a better chance for all people to catch fish, and that always makes it more fun, despite the fact that it is a contest. Larry Seeman has a commanding lead in the series, and, at Ashland, has a great chance to hold it. He also holds the Big 5 lead. I'm considering donating $ for a prize for Big 5: a nice pair of leather pants to go with that champion's vest that Larry will win. Click here for WCCL details! Good one Frank, But it isn't over yet. Think my I lost my horeshoe. After ottawa and Montomery, im sliding down hill fast. Wow, looks like the one from the "Village People"
...Count me in on the dogs Larry! Just preparing my "secret" bait for the big session at Ashland this weekend. No time to post additional accoutrements that might work with your championship garb. .